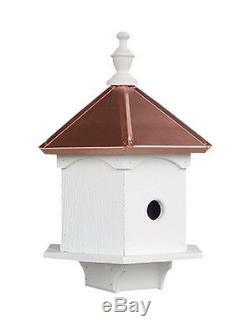 WILLOW RUN COLLECTION DOUBLE BLUEBIRD BIRDHOUSE 2-Hole with Copper Roof. 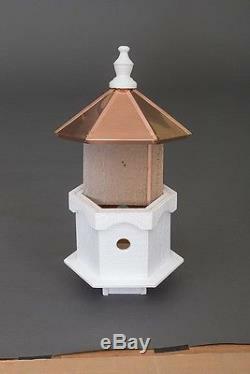 2-Hole Bluebird Birdhouse with Copper Roof has top-of-the-line construction, materials, and design by a. It is made with 3/8 pine which is given a generous coat of weather-resistant white ZAR Rain Stain on the outer slats and perches for protection against damage from the sun, rain, snow, and mildew. The standing seam copper roof is topped with a decorative lathe turned finial. 18" high x 14" wide. Complete with a post mount bracket and ready for 4" x 4" post mounting (post not supplied). The item "BirdHouse Double Bluebird Amish-made with Copper Roof" is in sale since Wednesday, June 08, 2016. This item is in the category "Home & Garden\Yard, Garden & Outdoor Living\Bird & Wildlife Accessories\Birdhouses". The seller is "amishshop" and is located in Lyndell, Pennsylvania. This item can be shipped to United States.